How calculate Molarity or calculating Molarity and Molar Concentration? What is the molarity of the solution with 0.70 mol solute in 250 mL solution? The concept of molarity is explained and problems determining molarity are solved. 1. Calculate the molarity of a solution made by dissolving 5.4 g NaCl in 25 mL of solution. 3. How many grams of NaOH are needed to make 400 mL of a 1.5 M solution? How to calculate Molarity/Molar Concentration? Molar concentration is the number of moles of solute that can dissolve in 1L of solution. Molar concentration is often referred to as molarity. 1. A saline solution contains 0.9g of sodium chloride, NaCl, dissolved in 100mL of solution. What is the molar concentration of the solution? 2. At 20°C, a saturated solution of calcium sulfate, CaSO4, has a concentration of 0.0153 mol/L. A student takes 65mL of this solution and evaporates it. What mass (in g) is left in the evaporating dish? 1. What is the molarity of a solution that contains 6 mols of solute in 2 liters of solution? 2. How many moles are in 600mL of a 1.5M solution of CaCO3? How to Calculate Molarity and make Solutions? 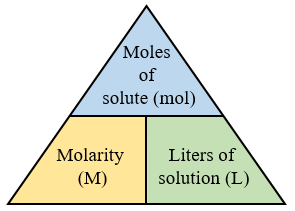 Molarity is defined as moles of solute per liters of solution. 1. What is the molarity of a 125 mL solution containing 0.050 moles of hydrochloric acid? 2. How many moles of sodium hydroxide are in 38 mL of 0.50 mol/L NaOH? 3. How much 25 mol/L sulfuric acid should you use if you need 0,12 mol H2SO4? 4. How would you make 100 mL of 0.40 M of copper(II) sulfate?